Actually, they have lots of tricks. The sloppily added bricks on the planter in Odeon Alley are an obvious example of defensive architecture, but there are plenty of aggressive pieces out there, policing Victorians’ sitting habits. Let’s take a quick tour. Metal bars block sitting on planters at a Fort and Douglas bus stop. There’s nothing subtle about these planters near Fort and Douglas. Back in the 1990s, VicPD said planters and benches were “‘key crime generators’ where the ‘criminal element’ hangs out” (p. 153). Lest we forget, “drug activity” is Victorians’ number one policing concern, with “homelessness” and “panhandling” ranking third and sixth, despite not being crimes. Surely taking away opportunities to sit down could eliminate homelessness and drugs, right? Almost 30 years have passed, so let’s check in. Whoa, whoa, whoa. You mean there’s still homelessness? And people still use drugs? Even with all those metal bars? That’s weird… All the defensive architects have to show for their efforts is an increasingly displaced and criminalized impoverished population, and some gross-looking planters. Years ago, one commentator wrote that the “metal parapets” on the planter at Douglas and Johnson “send the unambiguous message” that it’s not for hanging-out or panhandling (p. 154). Those same metal bars can be found in the parking lot at the southwest corner of Pandora and Quadra, and in Harris Green. There are benches and un-barred planters very close to Harris Green’s defenses, so if someone wants to sit, they’re going to find a place to sit. I think the likely motivation is that the property owners wanted to help customers avoid those living in poverty and visible homelessness, so they blocked the planters closest to the businesses, to drive people further away. That gives customers a decent shot at buying toilet paper and cat food without having to think about privilege and government-sanctioned poverty. Metal bars outside a yoga studio at Fort and Cook. The same bars are outside the tax preparation company next door. The metal bars outside this yoga studio on Fort exist for the same reason as the metal garbage at Harris Green. The “Be Accessible” sign is a nice change from the no loitering signs that usually go with these things, but it's more than a little ironic. A planter spiked with jagged rocks at Government and Belleville. 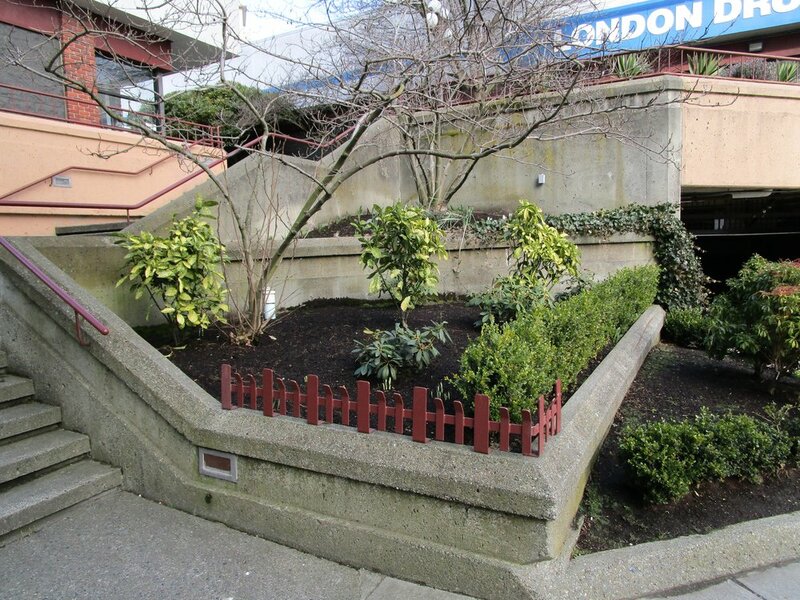 There’s no sitting on this planter at Government and Belleville, across from some of Victoria’s top tourist attractions. There are some benches around, but these raised rocks definitely hate human beings. The only real difference between this planter and the Odeon’s is that there was never a time when you could sit on this one. A lumpy rock wall outside the Yates Street parkade. You can still sit outside the Yates Street parkade, but the warped rocks are there to make you think twice. The uneven edges may be a shot at skateboarders as well. I think these rocks and the Government and Belleville planter are in some ways worse than the metal bars, which are pretty straightforward with their intentions. These ones are designed to look artsy, not exclusionary. Even if the designers weren’t thinking about how people wouldn’t be able to use these spaces, the effect is the same: for people without private space, there are two fewer public places to sit comfortably. Rocks block access to ledges on Pandora, between Cook and Vancouver. Rocks on a ledge at Pandora and Amelia. These stones are likely targeted at sleeping more than sitting, but either way the intent seems to be to discourage people from using that space. What’s worse than businesses engaging in these types of discriminatory shenanigans? How about when our local governments do it? 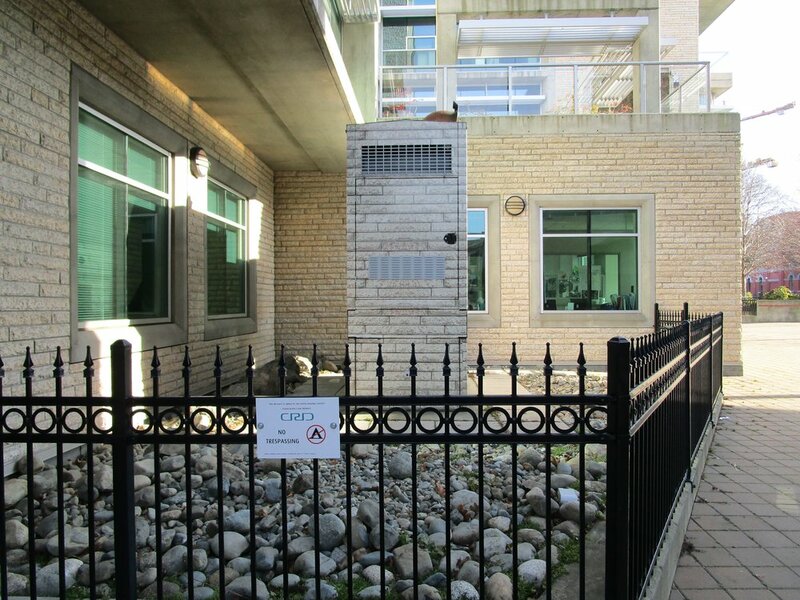 Fencing protects rocks at the CRD building in Centennial Square. If someone from the Capital Regional District wants to go on record about how ‘no, actually, promoting stones is a key part of the CRD’s strategic priorities, and that’s why we have a courtyard of stones surrounded by a spiked fence and no camping signs; it’s so no one disturbs our fine Victorian stones,’ please get in touch. Until then I feel comfortable saying those stones are to stop people from sitting or sleeping in that space, and the spiked fence and signs are there for anyone who didn’t get the hint. All of these pieces are part of Victoria’s larger, unspoken defensive architecture strategy, which is intended to move visible homelessness and poverty outside of the downtown core by restricting available space. The people who benefit are those who would prefer there be no reminders that criminalizing and displacing people somehow hasn’t ended homelessness. Displacement wasn’t a solution to homelessness and poverty in the 1990s, and it’s not a solution in 2017.